DocuSign Inc. recently went public in a highly anticipated IPO. For good reason, this billion-dollar unicorn had investors excited. Since its IPO in April, the DocuSign company has been outperforming market expectations. In addition, it has become a major catalyst for accelerating digital transformation. Despite the potential for tremendous competition and TAM estimated at $25 billion, the DocuSign company has remained the category king after years of pioneering the market. Why? Was it luck? No, being the global standard requires a bold strategy. Is DocuSign a noun or verb? It is both. The DocuSign company facilitates two parties coming to binding legal agreement on a secure online platform. Gone are the days when bike messengers had to deliver contracts for signatures. Instead, parties can “DocuSign it”, with digital signatures cutting out the middleman. Now, the company’s name is synonymous with quickly executed contracts. Meanwhile, the DocuSign market share is immense. And it took a bold strategy to get there. What is DocuSign’s bold strategy? To create an open platform by building a strong value proposition for a network of consumers and businesses. Along the way, it erected barriers to entry and increased business leverage by building deep partnerships with powerful tech companies. In addition, they defined the industry standard for trust. By positioning paper and manual processes as the competition, the DocuSign company established themselves as champions of a noble cause—with no threat of direct retaliation. There is a strategic advantage in knowing what customers need better than competitors do, and using that knowledge in product development and marketing. Of course, the key is getting a diverse set of powerful influencers and experts on board as advisers and advocates. As such, the 200+ person DocuSign Advisory Board includes global executives and industry experts and provides a vast source of the product, market, and strategic insight, as well as executive connections. Along the way, many Advisory Board members have become customers. And all of them can articulate the strategic relevance of the DocuSign company and quantify its value proposition. The first steps in creating and winning a new market are identifying a strategic beachhead, storming it, and then occupying it as a defensible position from which to expand. Sure, the DocuSign company had dozens of potential submarkets available, but the company decided to focus first on real estate. Curiously, it was a small enough market to own and live off for a while. However, it also provided wide reach and strategic high ground from which to attack adjacent markets. 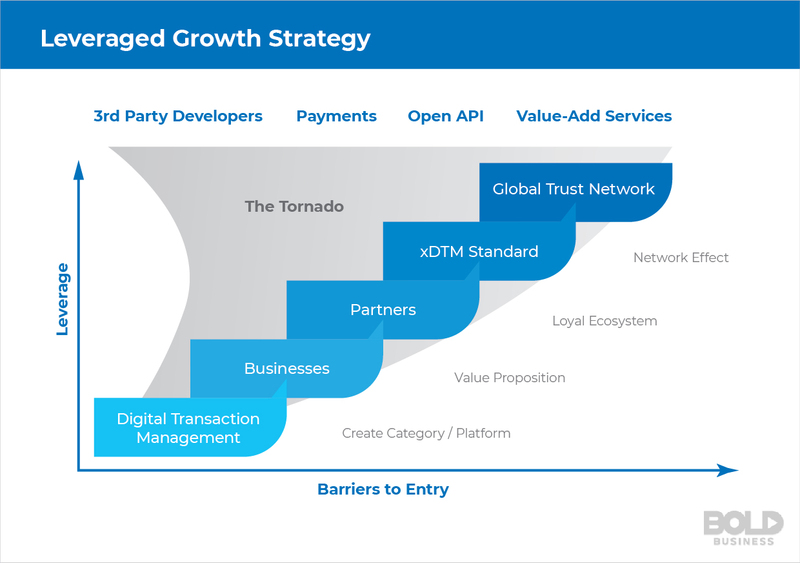 The DocuSign company’s leveraged growth strategy promises to maximize business-relevant factors in a “tornado” of expansion. Soon, the DocuSign company became the global standard by systematically focusing on one beachhead after another. These beachheads were a combination of key verticals, horizontal-use cases, company sizes, partners-installed base, and geographical markets. Collectively, they translated into a market share of massive proportions. Wisely, DocuSign used a strategic equity financing strategy to create four-dimensional partnerships with global giants like Microsoft, Google, SAP, Visa, Deutsche Telekom, Intel, Dell, Salesforce, Comcast, Samsung, and FedEx. 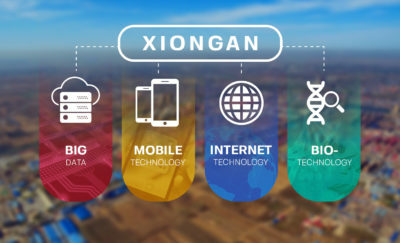 All of these partnerships included equity investment, enterprise customer agreements, technology integrations, and go-to-market strategies. DocuSign’s plan not only turbo-charged the market, but it also gave it the ability to tap new markets, leverage its partners’ presence and scale, build a brand, and even block potential new entrants. Through its strategic equity partnerships, the DocuSign company built up a war chest of cash by raising money before it was needed. Large cash reserves gave the company the luxury to plan long-term, keep key projects in stealth mode, and take strategic risks without being shackled to the “90-day shot clock” of a public company. Thankfully, this enabled the DocuSign company to turn giant potential competitors into cheerleaders and eliminate some international competitors by acquisition. A dominant DocuSign market share comes from a history of delivering their deliverables. In the chaotic early days of a new technology market, the standards for quality and trust take time to develop. Sadly, this often happens randomly. However, the DocuSign company drove the establishment of the xDTM Standard with a prestigious Board of Governors. They did this via the analogy of “what the PCI Standard is to Payments, the xDTM Standard is to Digital Transactions”. The move institutionalized DocuSign’s “Framework for Trust” by setting standards in eight quantifiable, measurable and audit-able areas: security, privacy, compliance, enforceability, availability, openness, universality, and scalability. With a Board of Governors that included the creator of the PCI standard, the Director of the National Institute of Standards, the Chief Digital Officer of the US Postal Service, and Secret Service officials, the DocuSign company was able to gain invaluable insight. Obviously, this insight would have otherwise taken decades to learn. The xDTM Standard enabled the DocuSign company to differentiate a crucially complex value proposition and made it easy for customers to quantify trust. Until that point, the only way they could measure trust was the age, size, and familiarity their potential vendor. What is DocuSign Global Trust Network? The DocuSign company’s bold strategy for future growth will involve even more innovation. The bold mission of the DGTN was to increase global commerce, productivity, and GNP for the world by providing an open global network for fast, frictionless and secure transactions. At last count, the DGTN has more than 450,000 companies and 400 million users in 188 countries. What is DocuSign’s Purpose for Bold Category Creation? The DocuSign company repeatedly used category creation and expansion to build and burnish its leadership position. First, the company created the new category of Digital Transaction Management (DTM) as the catalyst for digital transformation. This case set the stage for the expansion of the category System of Agreement (SOA). This is a broader, more enterprise-scale solution. 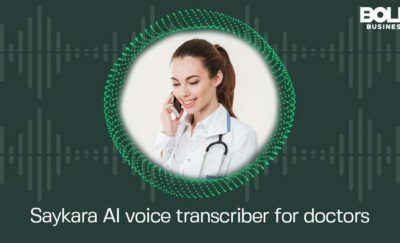 It’s one that integrates and automates the contributions of all front- and back office participants in the agreement process. The DocuSign company used category creation as a preemptive strike against potential competition. So, what is DocuSign’s purpose for it? Veritably, it was not simply a mechanism to challenge the status quo—it was to maintain an undisputed leadership position. Still, with much of the company’s growth hinged upon their category-based strategy, the path ahead is clear. Want to expand the DocuSign market share? Then clearly, a category expansion strategy is in order. 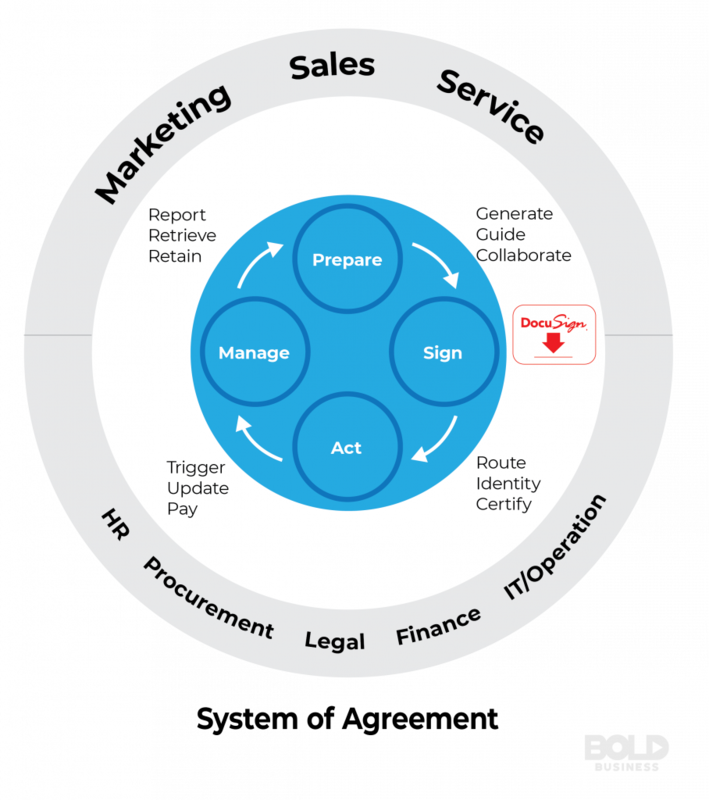 As the below chart shows, the DocuSign process can be boiled down to four components of a cycle: prepare, sign, act and manage. Those components can be further broken down into a dozen more actions, like a report, generate, certify and trigger. But, what if you expand the range of those serviced by the SOA process? By expanding the categories in their System of Agreement, the DocuSign company anticipates further growth. Without question, DocuSign is a transformative organization that promotes enterprise efficiency. However, the focus is not solely on profits and revenues. Under bold leadership from individuals like Keith Krach, Dan Springer, and others, the DocuSign company serves as an organizational role model. It is probably one of the greenest companies on the planet. The DocuSign Impact Foundation transforms people’s lives through noble causes. What is DocuSign’s next move? For sure, transforming into a category king and achieving escape velocity does not happen by accident. Conversely, the DocuSign company team has had its share of mistakes and failures. And yet, understanding the history of the company’s strategic chess moves creates an enormous amount of pattern recognition and insight. This can be applied to future strategic choices, and further increasing its market share. With a market share putting it miles ahead of the competition, it’s hard to deny the company’s position at the top. Like Mark Twain said, “History doesn’t repeat itself, but it often rhymes.” Given the impact, the DocuSign company has already made in e-signature, DTM, and now SOA, further industry disruption is highly likely.